Paramecium caudatum is a peniculine oligohymenophoran ciliate that has numerous rows of cilia called kineties that run along the posterior to the anterior axis on the cell’s dorsal side but curve around the oral region on the cell’s ventral side and end to form the anterior and posterior suture lines that extend from the oral region to the tips of the cell. This is a cross-section of P. caudatum near its anterior end showing a layer of trichocysts that lie under the cell surface. The surface of the cell is sculpted into ridges and the cilia arise from the bases of the concave invaginations. 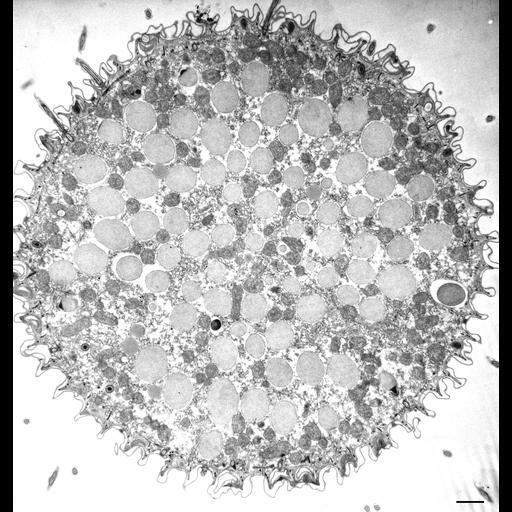 Each concavity represents a section through one kinety so that in this micrograph approximately 58 kineties can be seen to surround the cell near its anterior end. At this low magnification one can also see large numbers of medium-opaque mitochondria near the cell surface and interspersed between the trichocysts. Collidine-buffered fixation. TEM taken on 1/18/74 by R. Allen with Hitachi HU11A operating at 75kV. Neg. 3,750X. Bar = 1µm. Standard glutaraldehyde fixation followed by osmium tetroxide, dehydrated in alcohol and embedded in an epoxy resin. Microtome sections prepared at approximately 75nm thickness. The negative was printed to paper and the image was scanned to Photoshop. This digitized image is available for qualitative analysis. There is a high resolution version of this image in the library (CIL:39112) which is available for quantitative analysis. Additional information available at (http://www5.pbrc.hawaii.edu/allen/).